For those of us that have stable financial and living situations, disaster is frightening but ultimately manageable. However, for those less fortunate a similar scenario threatens to put them in life threatening situations. After a flood, tornado or other major disaster, less fortunate individuals often rely on the help of others who are better off than them. Many individuals, including children, fall victim to a mixture of poverty and disaster every year. With your help, however, you can help those in desperate need of assistance. 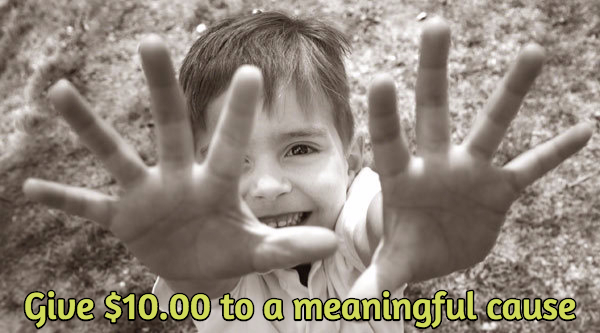 Give $5.00 to an outdoor charity RIGHT NOW!Money is perhaps the best form of charity and support you can give. Without it rescue organizations and initiatives will have a hard time maintaining all the costly resources they need to help impoverished communities in disaster scenarios. Food, shelter, clothes, and many other important items are crucial during long periods of post-disaster relief to sustain the shelters in which many people seek refuge. How much money and volunteers a community will need will ultimately depend on its size, but the more people who pitch in, the better. Even if more money is raised than needed for that particular scenario, the excess money can be invested in being better prepared for the next time disaster strikes. Being prepared before a disaster strikes is important for providing the quickest and most efficient assistance services possible. In small communities, disasters such as floods and tornadoes may only end up harshly affecting a handful of families. Offering your personal home as a refuge for affected individuals and families can help save local efforts the pricing of renting out or building shelters for the affected, and allow them to instead focus their efforts on other important areas. Saving those in crisis has always been a community effort, so simply ask those in charge of relief efforts how you can best serve those in need. Impoverished families who are affected by these disasters may be exposed to long-term issues. For example, injuries sustained from the disaster may lead to life altering scenarios such as amputation. Some people can simply not afford the expensive medical upkeep of the conditions they were unfairly dealt, so it is important that portions of relief effort funds are put towards future health care for those affected. If you are a craftsmen or contractor, you can provide pro-bono services that will be just as good as money for those whose homes have been seriously damaged. Mold, structural damage, water damage, and other hazardous situations will present one of the largest obstacles for these families to overcome post-crisis. Giving a helping hand, free of charge, will help you serve your community in the best way you can. Additionally, this will help you be seen in a positive light by members of your community; so it is good for business as well. Unfortunately, not all communities put the best efforts into helping impoverished and struggling families recover from life-altering disasters. With the sometimes up-in-the-air nature of government services like FEMA, aid is often most stable when provided by a caring community. The feeling of compassion and love that only close community members can provide is also important to those in these dire situations. In fact, aid provided by the government usually has a much shorter timeline than those in crisis need to recover fully. Some families will find themselves allotted a free week in a hotel to help their post-disaster situation, but for those who are impoverished this simply provides too little support. Long term shelters are crucial to allowing those who have lost their home to find safe, affordable, and plausible long-term living accommodations. As I mentioned before, preparation can help make the impact of these disasters less intensive. Funds raised by the community for disaster relief can be put toward providing families with emergency kits, keeping them educated on the best risk-aversion techniques and preparing for future disasters. If a community fails to invest at least a modest amount of their funds toward pre-disaster preparedness efforts, the likelihood that the disaster will have a more negative impactful rises significantly. The loss of home, severely damaged property and a sense of displacement put a high emotional burden on those affected by disasters. Without the proper community-based support and relief efforts, affected individuals are more likely to become victim to a cycle of poverty, poor-health and crime. Investing in providing the best possible disaster relief is an investment in the safety, reputation and overall ethical strength of a community. Money is power in these situations, so it is up to those in a better financial situation to help out their fellow citizens in need. If you are interested in giving money or other forms of support to local relief efforts in your community, start reaching out as soon as possible. Knowing when a disaster will strike can be nearly impossible in some cases, so the time to start preparing is now. Contact our friends at SDWP in Cleveland Ohio for an inexpensive website today!